ARE THERE PEOPLE WHO CAN SEE THE FUTURE? Unlike what many people and pseudoteachers will say, fortune-telling or divination does not exist in the physical plane. Nobody in the physical plane is capable to foretell future events; unless that person is a time traveler, there is no other way. It doesn’t matter if astrologers, soothsayers or false prophets say that the end of the world is near, they are only making a forecast and there is no certainty that those predictions will come true. Even the Bible has “prophecies” made by Divine Energies, but these forecasts are not necessarily going to be true, they are projections or calculations made hundreds of years ago that were fulfilled coincidentally. Entity that came to dialogue: Kether (the Ancient of days). Interlocutor: I will ask you a last question that a person asked me recently and I didn't know what to answer. The person that sent me this email says that a friend of his wife reads the cigarette and she can foretell the future. Now, we know that nobody, except the Absolute and time travelers can know the future, then, what happens when somebody "reads" the coffee, or any other similar divination method? Kether: These people have a higher intuition and somehow they can visualize the future making a projection, a calculation. But the word divination doesn't exist in the physical plane or in the spiritual world. Telepathy does not even exist in the physical plane. We know that what they read are merely emotional impulses. In this case, it happens exactly the same thing: this person uses a higher intuition and since she is convinced that what she does is certain that is to say, foretelling the future, the same person believes it, and suddenly, as the other people around her are too naive, in a negative way, suddenly this person with alleged powers say things that maybe they were expecting to hear and they took it as something supernatural. When I speak of naivety in negative way, I don't mean obviously to the naivety that one should have to understand the things of the spirit, characteristic of children without preconceptions, but to the gullibility of a person who wants to believe to the other by all means, even at risk of being deceived. And this not only happens in your world but in many other worlds, and this was even said by our Father, the dear Eon – and I’m reading from the mind of my vessel – many beliefs instead of raising people up, they are plunging them down because during thousands of years of your world, these beliefs have dominated through fire and blood. Then, when I speak about naivety, I am speaking about a naivety that opens the way to those aberrant beliefs, and then it is praised that person who reads the coffee or the cigarette and doesn't give any teaching. The true spiritual way, badly called esoteric, because it doesn't have anything hidden - nothing is hidden for the one who knows how to see the message. Most of these people don't give any message. What they do is to deceive with pseudo-divinations, as it surely happens to this person who asked you about this. I want you to understand very well the difference between both naiveties. The naivety that my dear brother Ron and the brother Jesus speak about, is the naivety of being born again, but the one of being spiritually born again, not the one of embodying again. And this means to have a concept of emptiness like this beautiful Master Siddharta was planning when he was incarnated. To have the empty mind, so that the body, the mind and the spirit can be truly illuminated. Incarnated beings do not have the power to foretell the future because this is an exclusive patrimony of the Absolute (Eon). Naturally, time travelers know the future, but only if it’s related to the physical plane. If they talk about it, obviously the guess has nothing to do with a prophecy. There are many people who allegedly foretell future events, but the truth is that given the generality or vagueness of the alleged “prediction” it might be applied to almost any other thing. In this case, they are only speculating about that future. For instance, if I throw a coin through my window, I can “predict” that it will hit the ground in 5 seconds, but if somebody is walking on the pavement below and accidentally the coin hits his head. My prediction will not be certain, then, it was only a calculation or a projection of that future event. 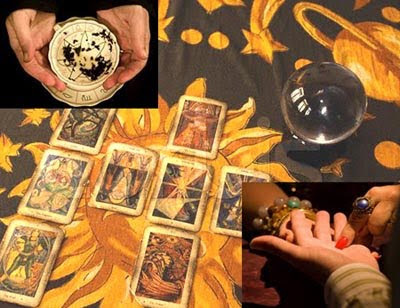 As for taromancy (reading tarot cards) the same thing is applied here, they are calculations or projections of the future that evidently could not be true in the future. On the other hand, chiromancy or palmistry, astrology and any other divination method are false sciences and they don’t have any validity at all. This entry was posted at Sunday, March 14, 2010 and is filed under Concepts . You can follow any responses to this entry through the .